System administrators in Knowledge Guru can add and remove game authors from a game shell at any time. 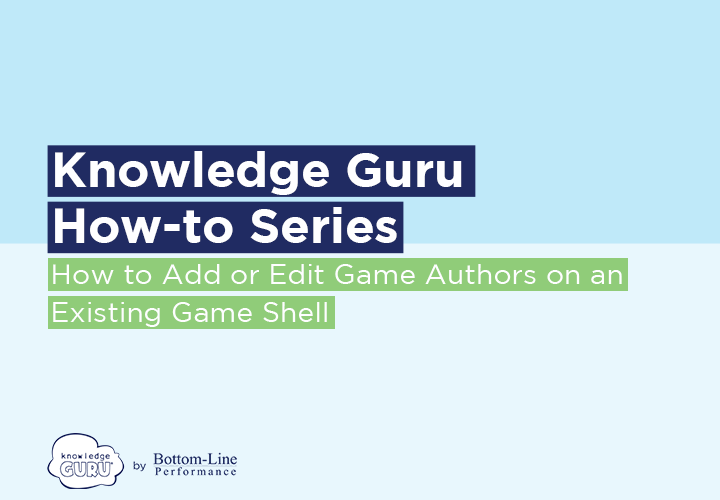 Each Knowledge Guru game must have at least one, but up to 10, Game Author(s) associated with it. Select your company from the game list. If you have no games, you will automatically be logged into your system administrator account. Select  GAME AUTHORS/CREATE GAME AUTHOR  from the left-hand menu. Enter the game author information and click  CREATE GAME AUTHOR. Select GAME SHELLS/EDIT GAME SHELL  from the left-hand menu. Select EDIT GAME SHELL for the game shell you wish to edit. Enter names of additional game authors, up to 10, in the Additional Game Authors box. Names should appear as you type if you have already added the authors to your account. Click the X for any additional game authors you want to remove, or use the dropdown to change the Primary Game Author. 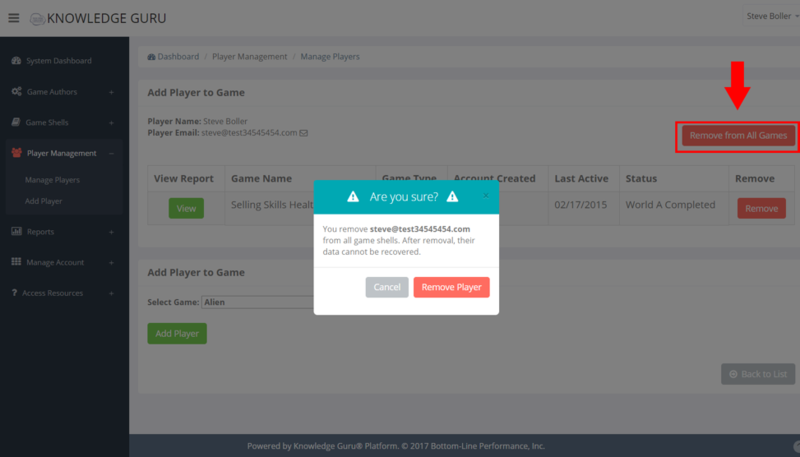 When you are logged in as a system administrator in your Knowledge Guru account, you can add, edit and remove players from all your game shells. The Player Management tool also allows you to view reports on how well your players are doing in each of the games. Expand the Player Management option within left-hand navigation pane, and select Manage Players. 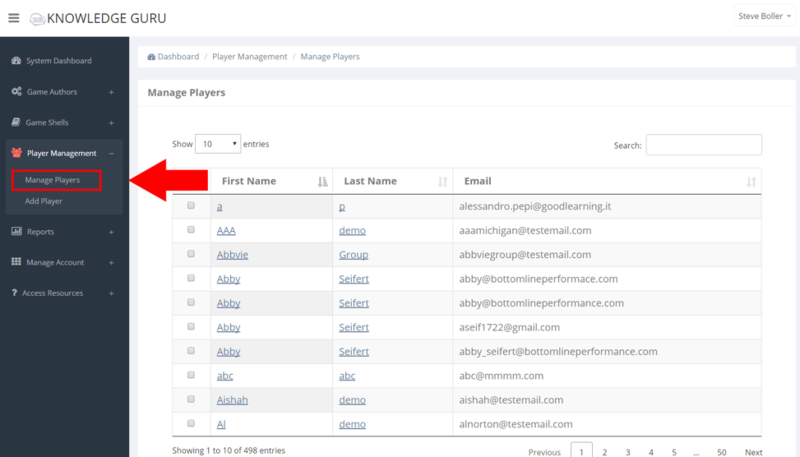 You can sort players alphabetically by First Name, Last Name or Email. Click one of the three headers to sort players by that header. Click the drop-down menu between Show entries to select different numbers of players to be displayed on the screen at once. Click on the Search input box to type in a first name, last name or email. It will dynamically search as you type. After you select the players you want to add to a game, click the Action drop-down menu and select Add Selected to Games. Click SAVE. 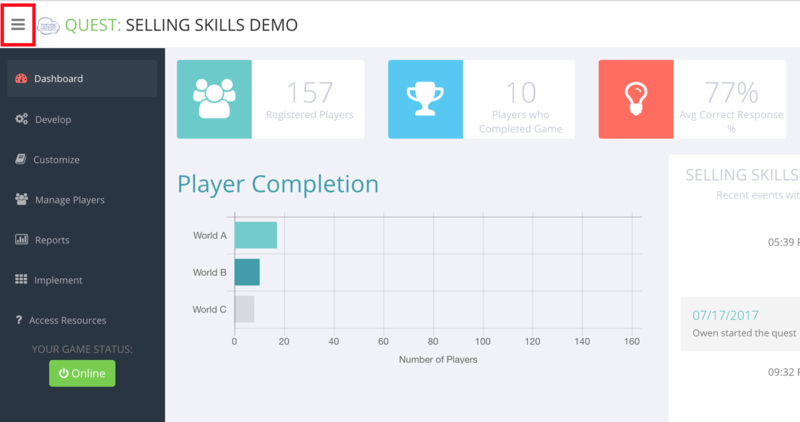 After you save, the authoring tool will tell you how many players were added to the games and if there were any failures. After you select the players you want to remove from a game, click the Action drop-down menu and select Remove Selected from Games. Click SAVE. 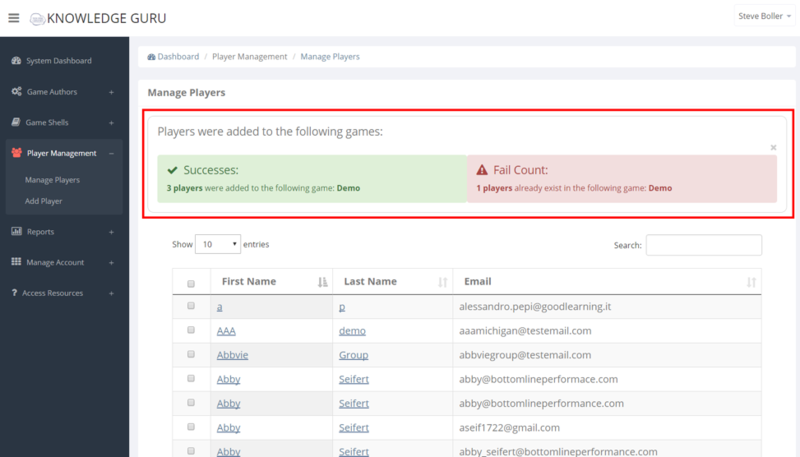 After you save, the authoring tool will tell you how many players were removed from the games and if there were any failures. Click on a person’s first or last name to view their individual status. Here you get a comprehensive profile of the player. You can quickly see which games they are in, how far they have progressed, and when they were last active in the game. If you want more details on how well they are doing in a game, click View under the Reports header. To remove a player from a single game, click the Remove button that correlates with the game row. To add a player to any game shell you have created, open the Select Game drop-down menu and click Add Player. If you need to remove a player completely from all your game shells, click Remove from All Games. A prompt will appear to confirm this action as you will not be able to recover any of this player’s data after you remove them. Expand the Player Management option within left-hand navigation pane, and select Add Player. Type in the first name, last name and email address of the player you want to add. Check the boxes next the game shells you wish to add the player to, then click the green Add Player button. 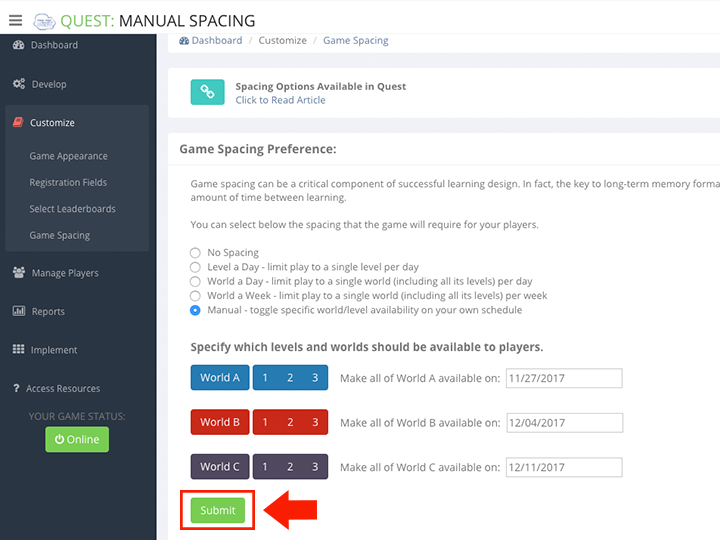 Manual spacing allows the game author to control what levels and worlds are available to their players. 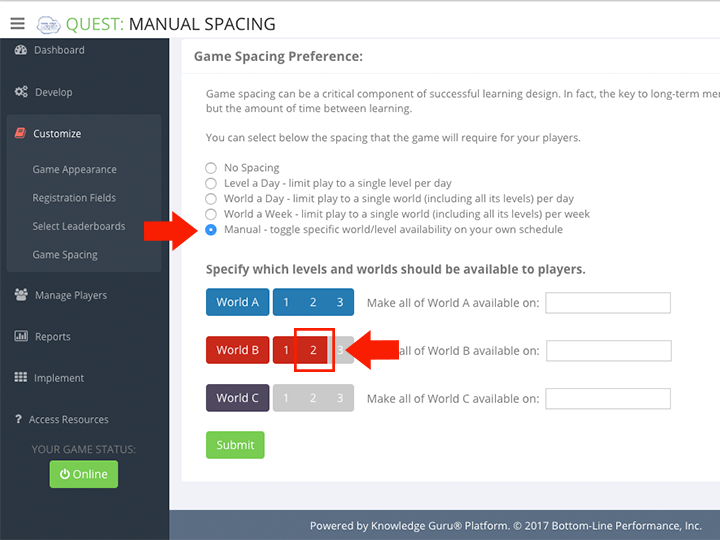 This is particularly useful when implementing your game as a daily or weekly competition. 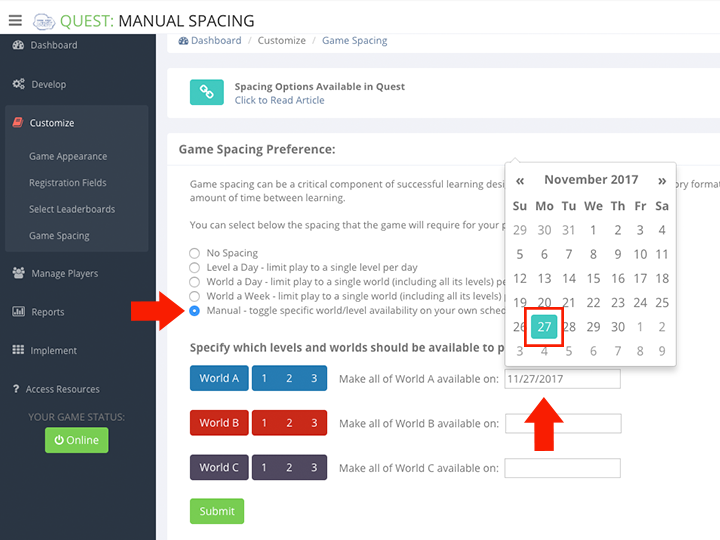 Authors have the option of immediately adjusting level availability or they can schedule an entire world to unlock at a future date. 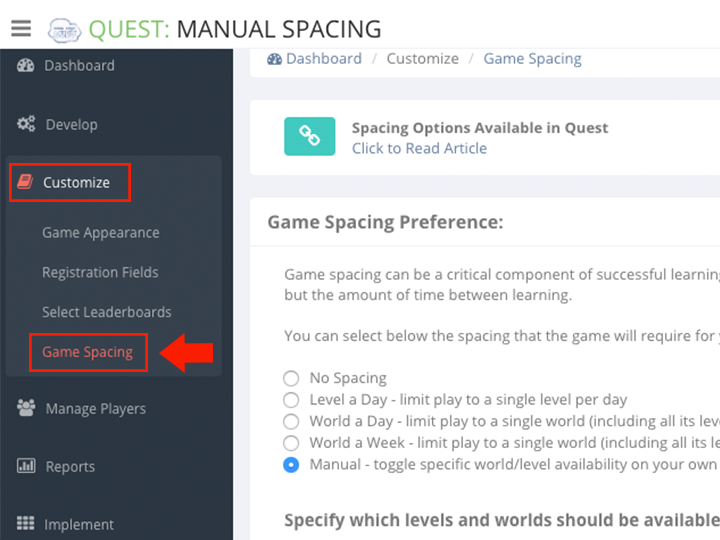 Expand Customize option within left-hand navigation pane, and select Game Spacing. Select the “Manual” option. A new interface appears. 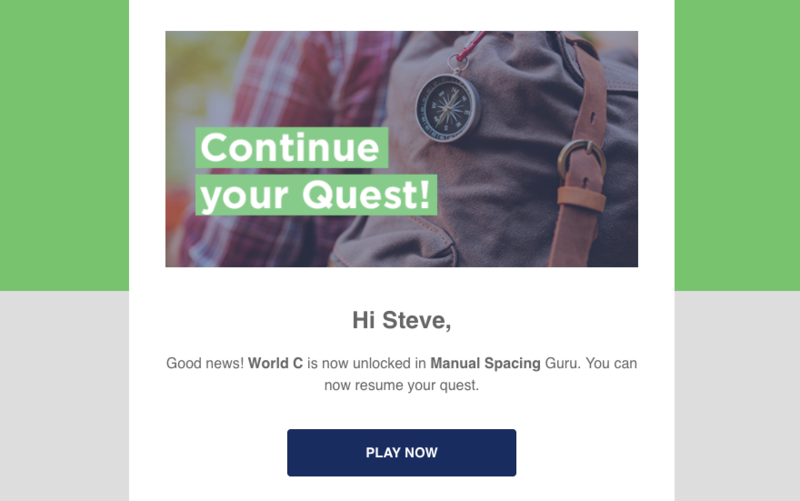 This is the email Knowledge Guru sends to players when a new level or world is unlocked if manual spacing is used and automatic emails are turned ON. Knowledge Guru administrators can choose to turn on a carefully crafted series of emails that players trigger with various in-game activities. 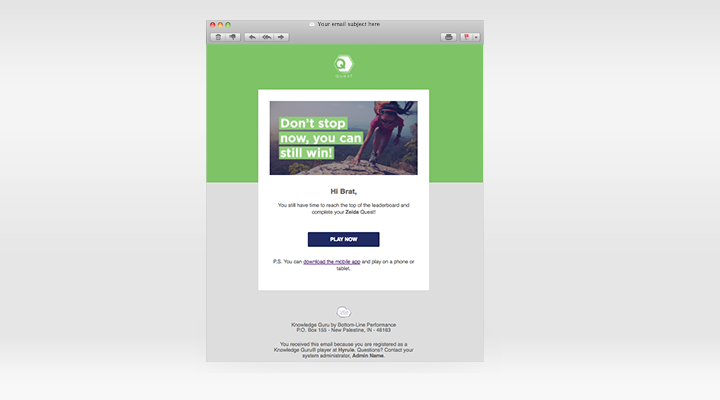 These auto emails are designed to foster repeat play, acknowledge significant accomplishments, and gently nudge inactive users. Motivational emails are designed to engage players who have gone at least a week without playing. They may need a reminder to come back and continue their adventure. A player won’t receive the same motivational message twice, and won’t receive them less than seven days apart. Once a player has completed their game or has received six motivational messages, the system will stop automatically sending them to that player. Players also receive a motivational email the first time they are passed on the leaderboard. 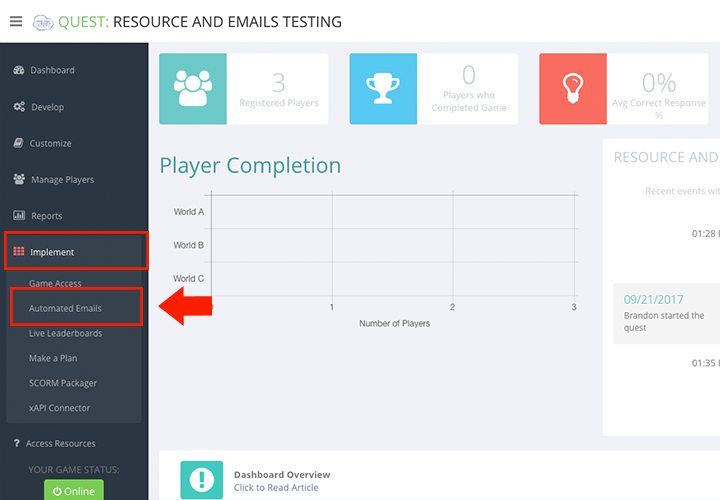 We encourage using automated emails to help keep players engaged with your learning objectives. This is something you can easily enable or disable as the Game Author. 1. 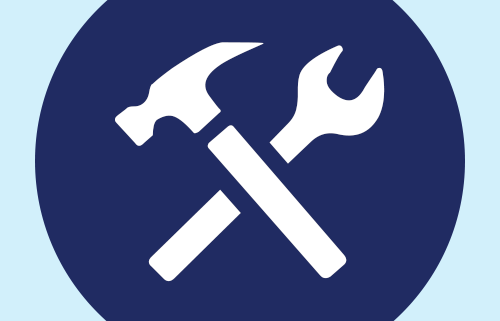 Expand the Implement option within left-hand navigation pane, and select Automated Emails. 2. Select REMINDERS ENABLED from the drop-down menu. Knowledge Guru is specifically designed to provide you with a lot of flexibility to achieve your learning objectives. One way we offer this flexibility is through “Resources” support. Resources allow you to add content that your learners can access and review anytime, anywhere. A resource can be as simple as a term and a description, or it can include a URL link to a website or PDF. Let’s say for example you are creating a Knowledge Guru game for onboarding new employees to your organization. The game itself may be created with references to material they have been exposed to in your company handbook, as well as opportunities for them to apply the knowledge they have learned. 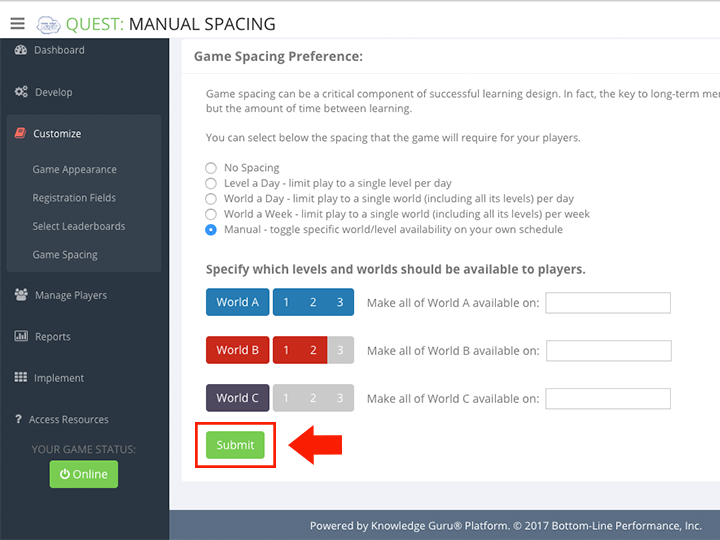 With Resources, you could also include a link to your handbook, which would enable learners to view it directly while they play Knowledge Guru. 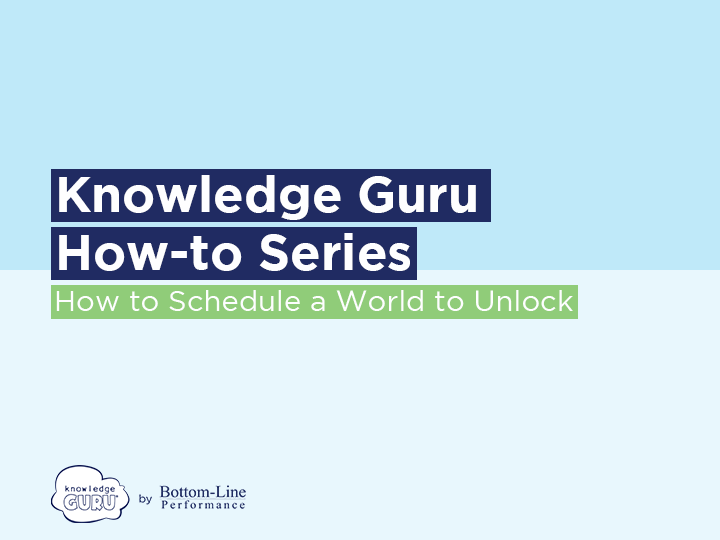 And since Knowledge Guru allows your learners to play at their desks or on their go on their mobile device, they will always have it with them. 1. Expand the Develop option within left-hand navigation pane, and select Create or Edit Resources. 2. Fill in your resource name, description, and optional URL. When you log in to a Quest or Legend game as a game author, you land on the main dashboard. This dashboard is your launching point for anywhere else you want to go within the authoring tool. It is also a source of summary information about your game and its players. Let’s look at how this dashboard is organized. 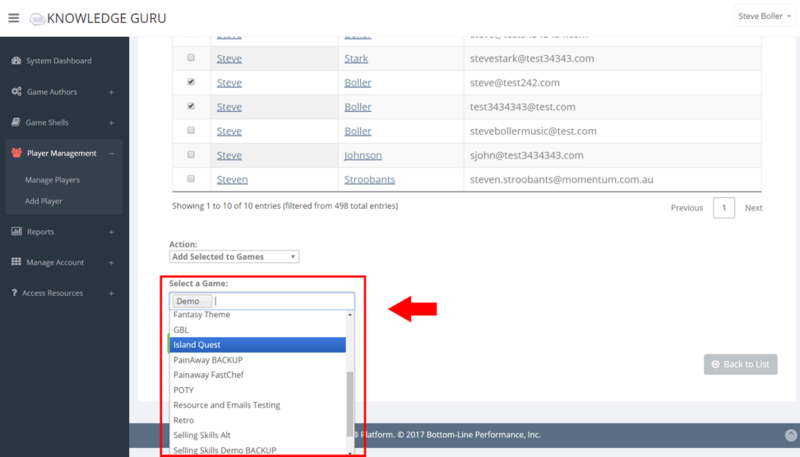 Each of these menu options can also be expanded to reveal sub-menu choices within each main area of the authoring tool. 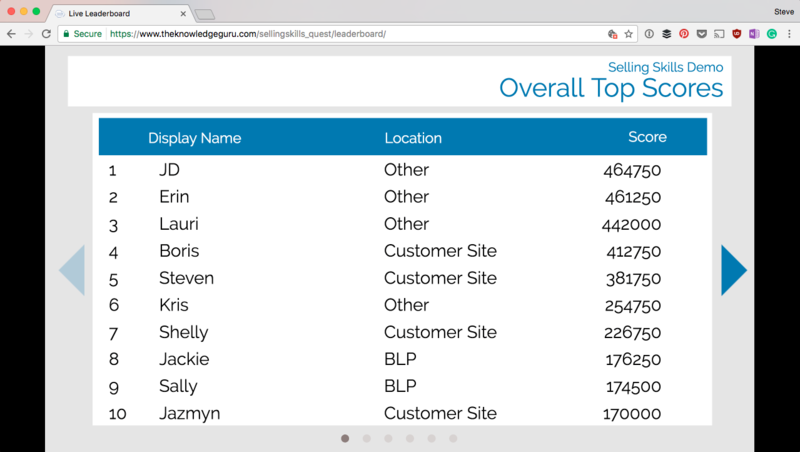 The top of your dashboard gives you a quick snapshot of your players and how they are doing. 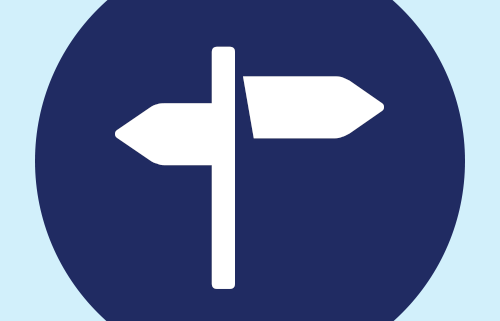 As the image shows, four icons are always visible. These icons let you see how many players you have, how many are active, how many have reached mastery, and the average mastery value. If your game has not yet launched, a Knowledge Guru Checklist to Launch will be displayed. This checklist outlines the six steps you need to execute to get your game created. Clicking any of the six steps provides you with a detailed explanation of each one. 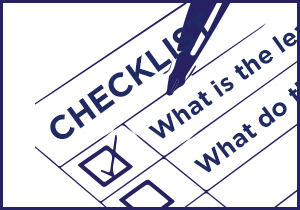 As you complete tasks, the checklist automatically marks the tasks off your list and changes the box from red to green. By clicking within a step, you can see a more detailed explanation of it. Once you make your game live, your pre-launch checklist gets replaced with additional player statistics. These statistics are dynamic. You can click within them to access full reports. You can also hover over the bars in the graph or the pie pieces in the pie chart to see specific data points. The bottom left portion of your screen will change to a timeline labeled KG Recent Activity. This activity log can help you see how long it took to create and put your game online as well as the most recent activities of the game’s players. The drop-down menu at the far-most upper right corner of your screen contains links to your profile settings as well as a log out option. Your profile shows the date your Knowledge Guru subscription expires and allows you to change your email and password. 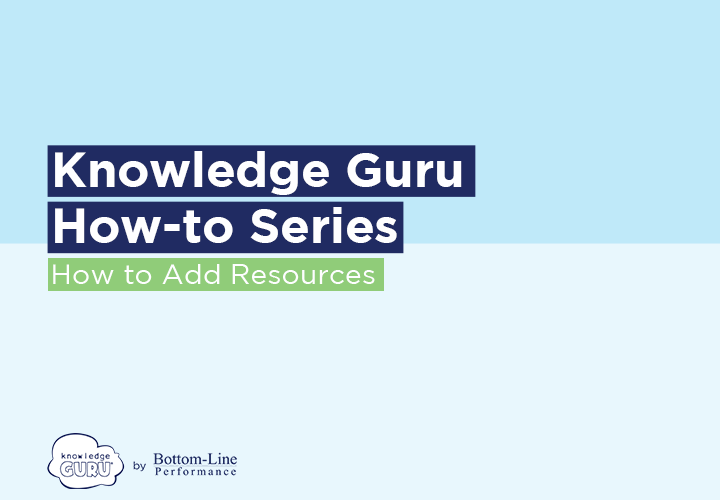 The Knowledge Guru Knowledge Base is always available to you via Access Resources in your navigation pane. 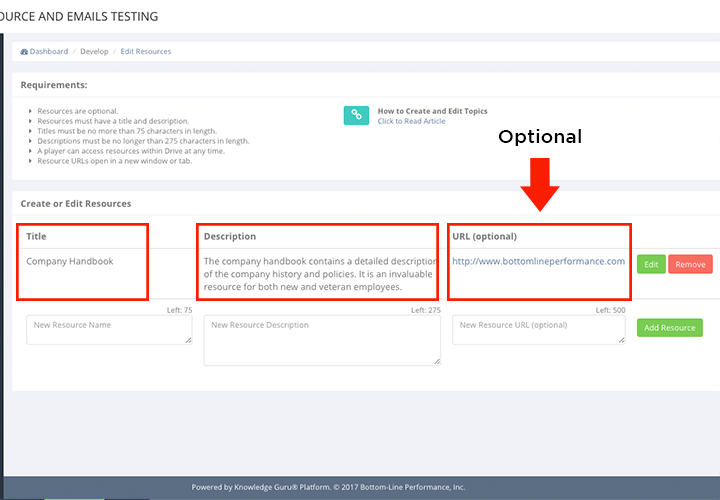 This menu option contains a link to the Knowledge Base as well as to Support. Knowledge Guru allows your learners to log into their games with their Salesforce.com account. Once learners validate their account credentials, they can log in with Salesforce and see all games registered to their Salesforce email address. 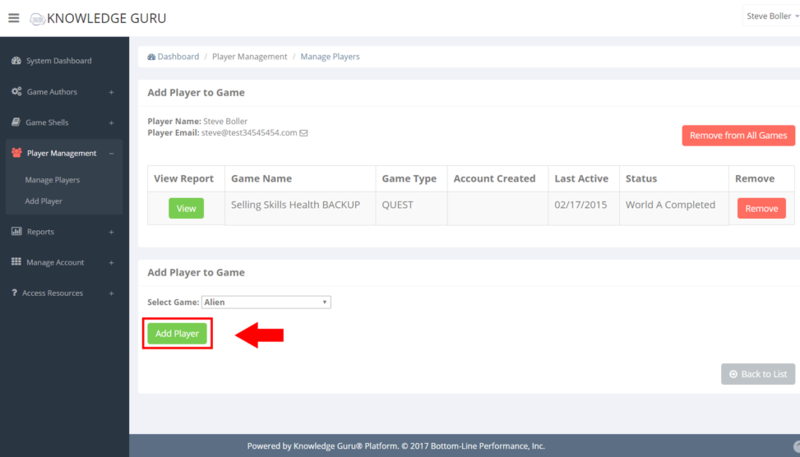 Players go to kguru.co/login or theknowledgeguru.com/login and click LOGIN WITH SALESFORCE. Players enter their Salesforce username and password. If it is their first time accessing Knowledge Guru from Salesforce, they will authenticate the connection. After authenticating, players see a list of their assigned games. 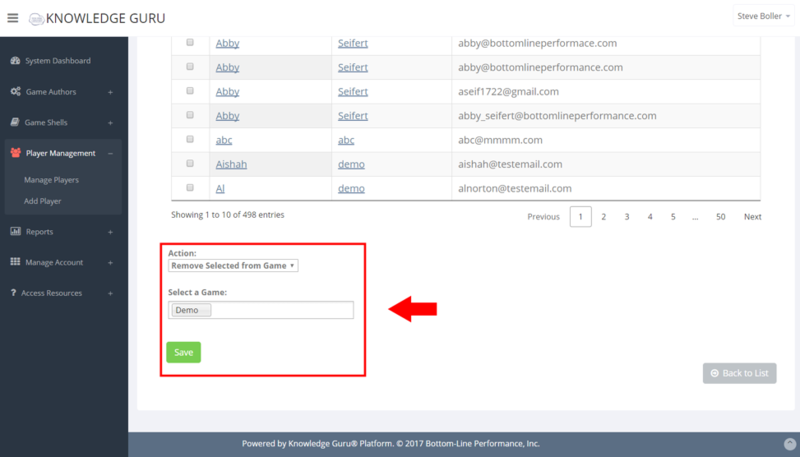 Players go to their game link (kguru.co/GAMENAME or theknowledgeguru.com/GAMENAME) and click LOGIN WITH SALESFORCE. Players tap LOGIN WITH SALESFORCE on the login page. 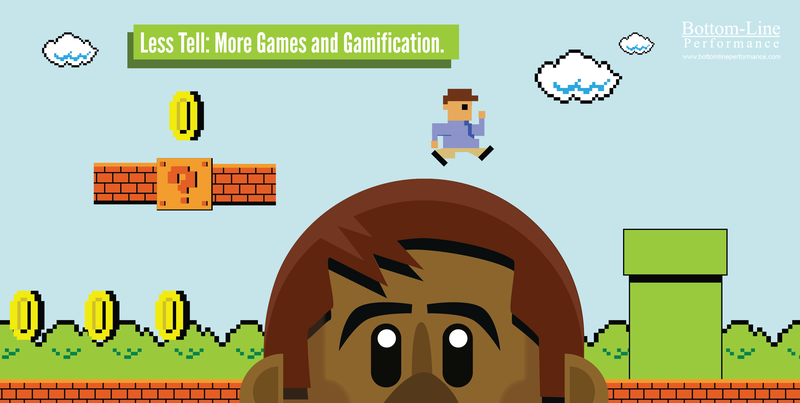 Are you launching a Knowledge Guru game that learners will play on their smartphones? If so, using these two links will make the process easier: kguru.co/GAMENAME and kguru.co/apps. All Knowledge Guru games can be accessed using either the full link (Example: theknowledgeguru.com/sellingskills_quest) or the short link (Example: kguru.co/sellingskills_quest). If players must type the link in themselves, sending the send the short link so it is easy for them to do so. This is especially useful when you display the link on a PowerPoint slide in a live event. The mobile registration pages for Quest and Drive games automatically direct players to download the appropriate app after registering. The mobile-first page kguru.co/apps has links to download the Quest and Drive apps from iOS or Google Play. You can send this link out prior to a live training event so that players have already downloaded the app before they arrive. Instruct players to download the appropriate app (Quest or Drive) at kguru.co/apps. Instruct players to log in with their email address and the default password that you set for them. Instruct players to visit your game URL on their mobile device: kguru.co/GAMENAME. Players fill out the form to register. After registration, Knowledge Guru will provide a link to download the appropriate mobile app. Players download the app, open it and login with their credentials. For implementation tips tailored to your needs, speak to your Knowledge Guru Specialist. 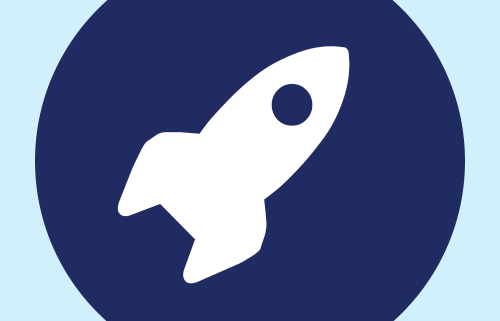 Our implementation pack includes timelines, tips, templates and images you can use to implement and promote your game. Spark learners’ interest so they take action to login or register to Knowledge Guru and get started. 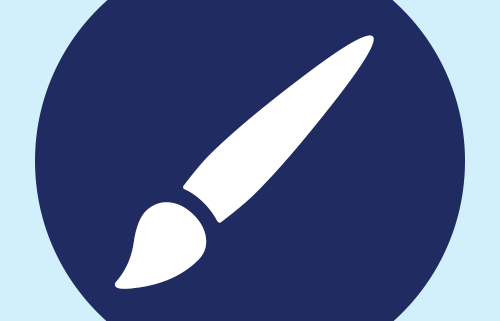 If learners will play Quest on a mobile device, they will also need to download the mobile app. Provide clear directions on how to access Knowledge Guru and get started with Quest or Legend. Think about your target audience. How many of these are true for them? The game is “required” by someone, and someone will be verifying their completion. They enjoy games and are intrigued by playing. They are competitive – and like visible evidence of a competition, such as a leaderboard. They love anything that gives them more information about themselves and how they are improving over time. They want quick hits that reinforce key knowledge or skills that improve selling abilities. Take time to assess players’ starting motivation – and be honest about what that motivation is likely to be. Your answers can help guide you in planning your implementation and choosing the best strategies for your audience. If the sole motivation to play is “because we have to,” you need to put more thought into your strategy. If Motivators 2-5 above exist for them, you need only make sure you provide clear directions on how to access Knowledge Guru – and make sure you repeat those directions so everyone “hears” you. If most of these motivators are absent, your strategy will need to go further. Complete your Quest and unlock knowledge. Join the ranks of the masters. 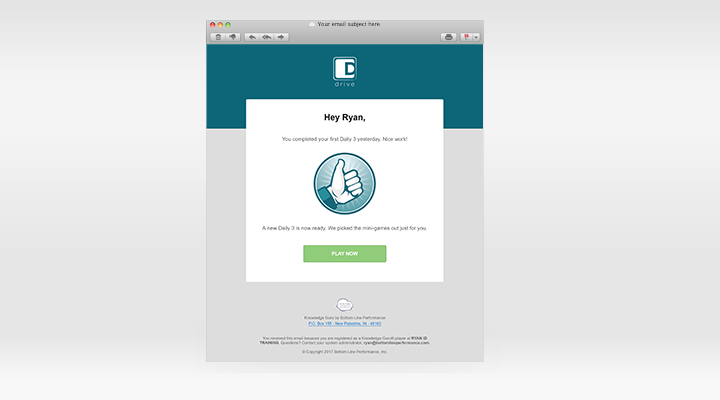 Include visuals of the Quest or Legend app in your messaging, particularly leaderboards or the dashboard. People respond better to visuals than to lots of text. Keep text portion of your message short and provocative. 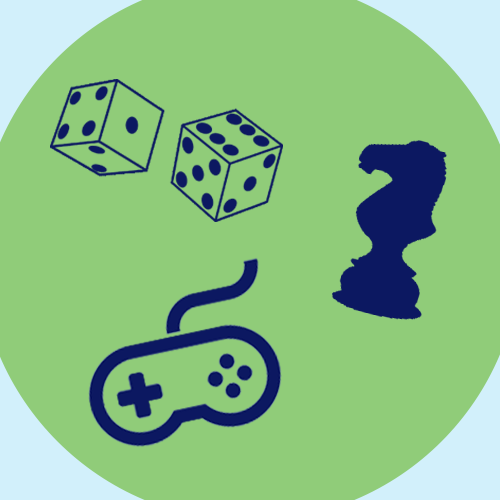 If game-based solutions are new to your organization and people are skeptical, consider offering prizes to underscore the significance of playing. The leaderboard makes it easy for you to award prizes for various things such as top scorer over a given time period, best department or another custom grouping. This keeps players on their toes throughout your play period. Prizes do not have to be big ones. Step 2: After registering, you will be automatically directed to a link where you can download the mobile app to your phone. 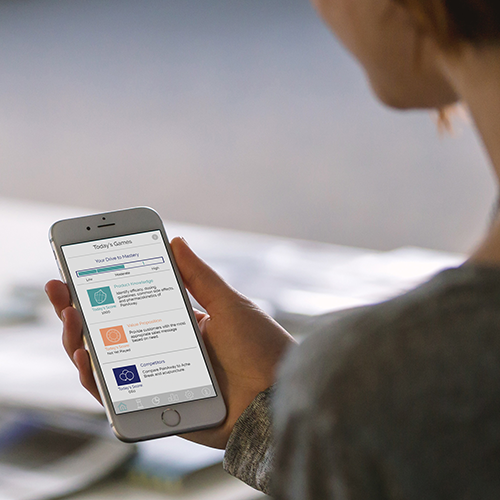 This app lets you access Quest on your phone for maximum ease of use. Step 3: Start playing to build mastery. Replay levels as often as you like to earn a three-star rating and move up on the leaderboards. 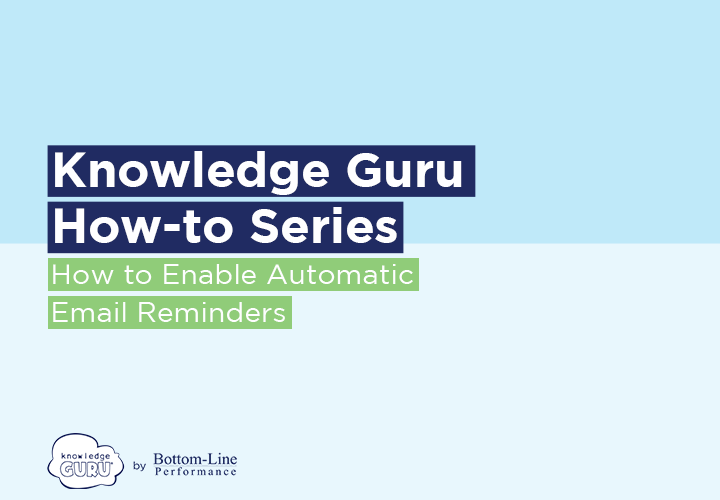 Be prepared to resend a variation of the message 1 or 2 more times to ensure all learners see the email. 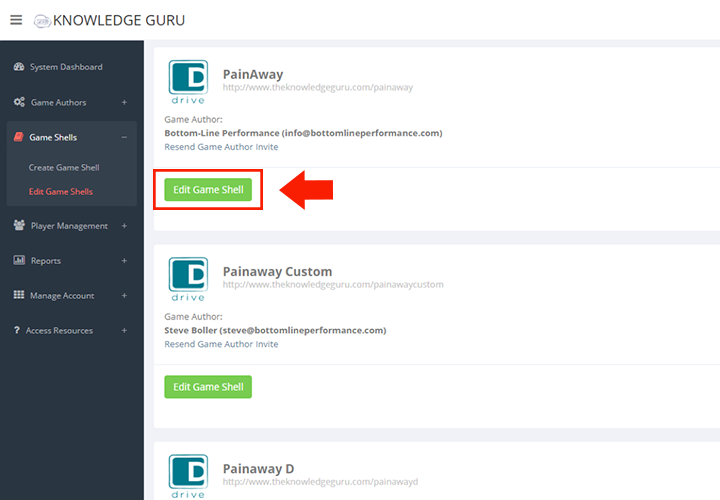 Monitor Knowledge Guru’s analytics to verify that players are getting registered and playing. Throughout the active play period, monitor player progress. Acknowledge players’ efforts and recognize top scores and engaged players. Share out final results. 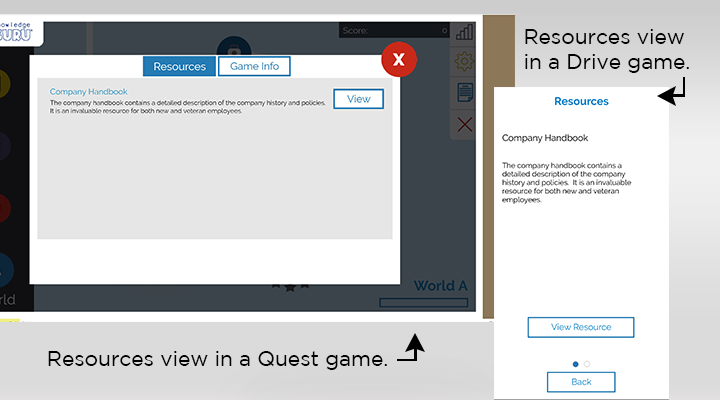 Use the reporting capabilities within the Game Administration tool to share relevant results, including the learning objectives your group did best and worst at. If you have some form of regular learning communication tool, use it to profile top performers and acknowledge their efforts.